Today’s story is a bit ribald. Some people would probably rather not have it told, but that rarely stops me from doing anything. So read on if you’re intrigued, and go find something else to do if you’re easily offended. On Belmont Avenue in Chicago, just west of Lake Shore Drive, there’s a statue of Civil War general Philip Sheridan. It was scuplted by Gutzon Borglum, nearly 20 years before he began working on Mount Rushmore. It’s located near the beginning of Sheridan Road, which runs along the shores of Lake Michigan northward to Wisconsin. If you live on Chicago’s North Side or on the North Shore, you know about Sheridan Road. Sheridan essentially cornered Lee’s army in 1865, which forced the surrender to Grant at Appomattox. He was praised by General Grant, and had a long and distinguished career in the military after the war ended. So it’s only fitting that he should be honored by statues and roads being named for him. So where does the ribaldry come in? Just stay with me for a few more paragraphs. 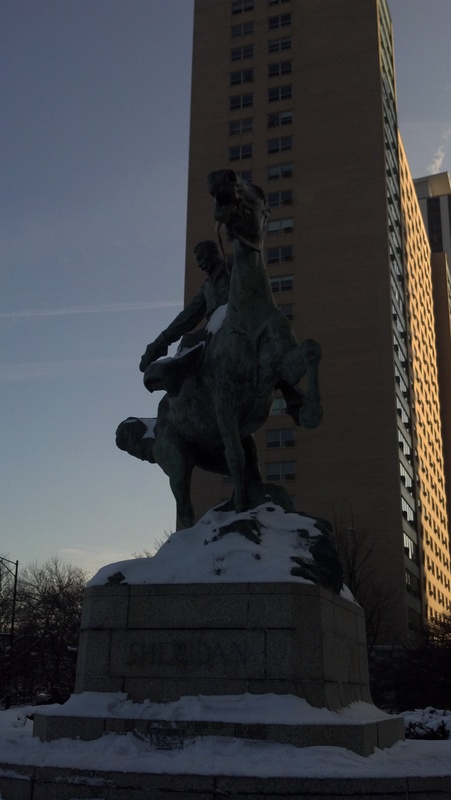 General Sheridan and his horse are located roughly a mile away from Wrigley Field. If you were coming to Wrigley from downtown, and taking Lake Shore Drive northbound, you would get off at Belmont, which would take you right past the General’s likeness. So somebody riding on a team bus must have had an inspiration one day, and thus was born one of the stranger baseball traditions you’ll ever hear about. I’ve heard that it’s a rookie hazing thing, and that makes sense. The veterans may not want to get involved with defacing public property, and the eager-to-please rookies are probably put up to doing it instead. After all, nothing says “I’m in the majors now” like climbing up to a horse statue’s manly parts. The one time that I’ve most noticed this–and if it’s done right, it can be seen from Lake Shore Drive–was with the bright yellow color of the Pittsburgh Pirates. The color I saw today (and yes, I did look) was a darker shade of red. For some reason I thought of the Phillies, instead of the Cardinals or the Reds or even the Diamondbacks. But any of them could have been the culprits. I doubt that an American League team would get in on this, since they only play one series in Wrigley every few years. This is more of a National League thing, I would think. I’m not sure how often this sort of thing transpires, and I no longer live close enough to the statue to keep tabs on it, but I have to imagine that the General’s horse is due for a fresh coat or two once the season begins.